The impact of major events and situations send clusters of numeric energy into view. These patterns form connections to a much wider and deeper picture. 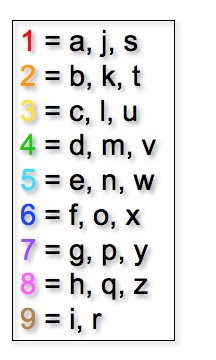 Wednesday, May 27, 2015, was a 22 day in the world (5+9+8=22). 22 focuses on global issues and the conditions under which the general population – and life in general – exist. May 28 marks the beginning of calendar week 22. Therefore, the 22 energy is extremely powerful until June 3rd, and possibly beyond. 2 is a slow moving energy and may linger as it departs. On Wednesday, May 27, America’s new Attorney General, Loretta Lynch, announced the arrest in Switzerland of several FIFA executives on charges of massive systemic fraud and corruption. FIFA is the organization which manages the most popular sport in the world – international football (or soccer in the USA). A stunning numeric pattern is forming around this shocking (but not totally unexpected) announcement. Week #22 is about to begin. The Letters in the name FIFA also convert to 22. (6+9+6+1=22). FIFA was founded on May 21, 1904. That date adds up to 22. FIFA was born on the 22 path. And exactly 55 years later, on May 21, 1959, America’s new Attorney General, Loretta Lynch was born. They share their birthday! Just last week, on May 21, FIFA turned 111 years old. (111 is an extended Master Number), and Loretta Lynch turned 56 (5+6=11). She issued 47 indictments against FIFA executives (4+7=11). She is the 83rd Attorney General of the United States (8+3=11). 11 is the master number of illumination and inspiration. It is the number of perspective, connection, and conveyance. (We cannot reach 2 until those two 1s peacefully merge). The 55 years separating the birth of FIFA and Loretta Lynch have significance too. 55 brings the kind of CHANGE that alters the entire direction of this journey through time. 55 is the most balanced form of 1 – the number of SELF – the individual – ego – masculine energy. 5 is the number of the sudden and unexpected, and 55 activates the emotional range in order to make us look at and understand reality. 5 represents adventure – and 55 is the energy we know as “adrenalin”. Week 22 always has some kind of ‘shock’ attached to it, or an element of surprise. These FIFA arrests came as a shock to a lot of people, including those who never dreamed that an organization such as this could ever be ‘reined in’. 55 adds up to 10. And innovative 10 adds up to 1 = CHANGE! 22 = the conditions in which people live – and are forced to live. FIFA’s purpose was to promote and facilitate football worldwide so that people everywhere, especially the youth of the world, could benefit from the positive aspects of the sport. But by 1991, the organization had begun to devolve into a pit of greed and corruption. Those involved were so focused on their own existence that they became oblivious to the harm they are doing to the rest of the world. So oblivious, so indifferent to the feelings and wellbeing of others, that in their zeal to build the infrastructure for the 2022 World Cup, the government of Qatar refused to allow Nepalese workers to return to earthquake-ravaged Nepal to attend the funerals of their loved ones. The workers are prisoners there. The Guardian reported that at least 1 worker per day DIES while building the infrastructure for the 2022 World Cup. It is estimated that the death toll will exceed 4,000 in the building of Qatar’s stadiums. 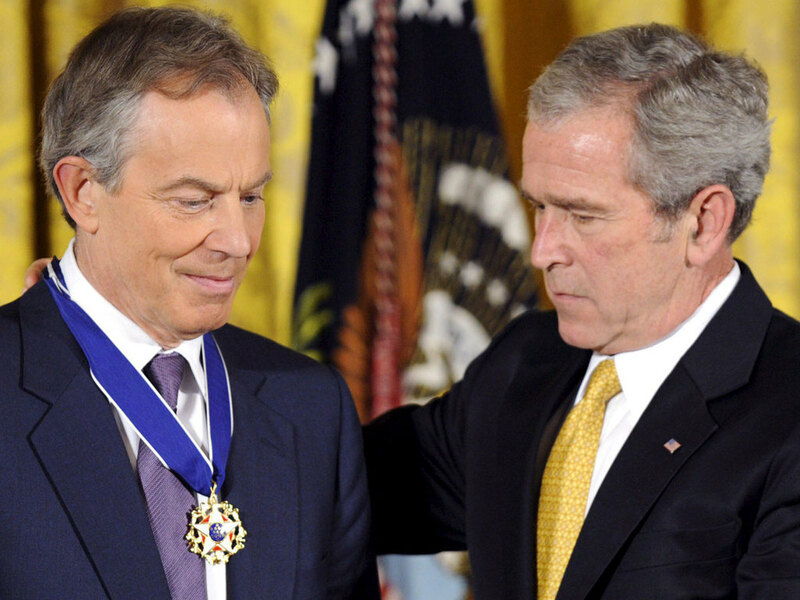 Tony Blair receives the Congressional Gold Medal of Honor from George W Bush in 2003. ALSO ON MAY 27, 2015: With just 45 minutes notice, ex-British Prime Minister Tony Blair, a principle architect of the Iraq War, resigned from his post of “Special Envoy to the Middle East” – a title that has never made sense, given his background. He’s in a 1 personal year in 2015 – and opportunity knocks! Taking a new direction is what the 1 year is all about. He abruptly resigned on a 22 day, the number of improving conditions for humanity. Tony Blair, one of the most unpopular politicians in the world, once professed that as “Special Envoy to the Middle East”, his goal was to improve conditions for the Palestinian People. 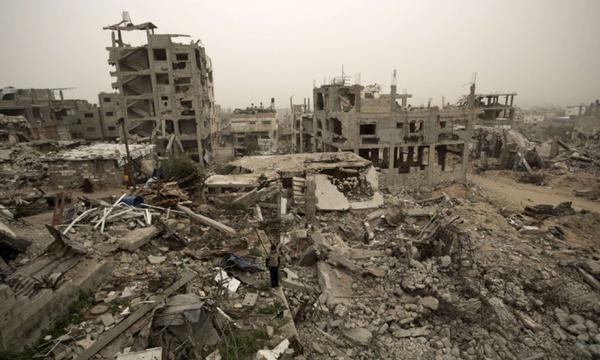 Well, this is what much of Gaza looks like right now. (Photo: AP). Humanity is reaching a new depth of awareness by looking at life as it is. Life is not an illusion. The illusion is this cruel, top-heavy, collapsing system that we’re stuck in, with un-evolving masculine energy leading the way – towards a very dangerous edge. The 11 energy has been SO powerful in our lives since the beginning of the 2000s, illuminating what we need to see, so that our feelings (our feminine energy) can develop to its next stage of healing. Right now, 11 is shedding its light on atrocity, hypocrisy, and ineptitude, shining through the walls of denial, and creating transparency. 22 is the result of two 11s. Thus the light-shedding openness of the 11:11 phenomenon. 11:11 = 22 = 4, the number of system, organization, work, and how things work. Also on that ‘22 day’, Wednesday, May 27, 2015, the state of NEBRASKA abolished the death penalty. It’s about time. After all, time is the framework on which we emerge, unfold, and evolve. Congratulations Nebraska! And now, on Thursday, May 28th, (a 5 day in the world), Week 22 begins…. This entry was posted in numerology and tagged 11, 11:11, 22, 55, death penalty, FIFA, human rights, Loretta Lynch, Nebraska, numbers, numerology, Qatar, Tony Blair, week 22. Bookmark the permalink. WOW what amazing insight, thank you! That’s very kind. Thanks Mary.